An elegant salmon dish that makes a beautiful presentation to serve your guests. Easy-to-make and very delicious. Can be prepared a day or two before your event. Recipe was shared with me by Ellen Easton, a tea and etiquette authority in New York. Check out more of Ellen Easton’s Tea Travels™ articles and recipes. Learn about the interesting Story of Pacific Salmon. More of Linda’s great Salmon Recipes and How To Select, Buy, and Cook Fish. Wash salmon filet and pat dry. In a skillet or frying pan that is 2-inches deep, add 2 cups Vegetable Stock and bring just to a simmer; reduce heat to low. Add salmon filet, cover, and simmer approximately 8 to 12 minutes or until a meat thermometer registers an internal temperature of 140 degrees F. (salmon will be slightly opaque in thickest part). Remember the salmon continues to cook after it is removed from the heat source. Once the salmon is cooked, place in a large bowl and mince (bones removed and finely flaked) the salmon with a fork; set aside. In a large bowl, soften the gelatin in the 1/2 cup cold Vegetable Stock. Stir in the 1 cup boiling Vegetable Stock and whisk the mixture slowly until the gelatin dissolves. Let cool to room temperature. Add the minced salmon, mayonnaise, Worcestershire Sauce, lemon juice, and salt and pepper to taste; set aside. Fold in the prepared whipped cream. Transfer the mixture to a large decorative mold or half-cup individual molds. Refrigerate at least 4 hours. Allow gelatin to set until completely firm, several hours or overnight. Prepare Cucumber Sauce. Refrigerate until ready to serve. Tips to unmold gelatin: Before unmolding, dip knife in warm water and run knife around edge of gelatin to loosen. Dip mold in warm water, just to rim, for 10 seconds. Lift from water and gently pull gelatin from edge of mold with moist fingers. Place moistened serving plate on top of mold. Gently remove mold. Serve with the prepared Cucumber Sauce. Garnish platter with roasted asparagus spears, marinated artichoke hearts, and deviled eggs. For individual afternoon tea savories, place the salmon mousse in either a two inch cucumber cup or on a cucumber slice with an added dollop of sauce on top. Place all the prepared onions and carrots into a large pot. Cover with water and bring just to a quick boil over high heat. Reduce heat to medium and let simmer for approximately 1 hour. Any longer than an hour and the vegetables will begin to turn mushy and begin to lose all their vibrant flavor. Remove the pot from the heat and season to taste with salt and pepper. Strain the vegetable mixture through a mesh strainer to remove the vegetables. Set aside the liquid stock until ready to use. The stock should be light in color, sweet, and translucent. To store, pour the strained Vegetable Stock into glass jars and refrigerate for up to a week, or freeze. Yields 4 cups of vegetable stock. * Use chives or dill weed (not both of them together). In a large bowl, combine sour cream, mayonnaise, lemon juice, chives or dill weed, parsley, salt, pepper, and onion powder. Add the grated cucumber and blend together. Cover and place in the refrigerator for several hours or overnight. Ellen Easton, author of Afternoon Tea~Tips, Terms and Traditions (RED WAGON PRESS), a lifestyle and etiquette industry leader, keynote speaker and product spokesperson, is a hospitality, design, and retail consultant whose clients have included The Waldorf=Astoria and Plaza Hotels. Easton’s family traces their tea roots to the early 1800s, when ancestors first introduced tea plants from India and China to the Colony of Ceylon, thus building one of the largest and best cultivated teas estates on the island. 64 pages, 21 color photos. A complete holiday menu includes 25 easy to prepare recipes; theme teas, decorating & gift ideas; invitation template and secret sources. Ellen Easton, author of Afternoon Tea~Tips, Terms and Traditions (RED WAGON PRESS), a lifestyle and etiquette industry leader, keynote speaker and product spokesperson, is a hospitality, design, and retail consultant whose clients have included The Waldorf=Astoria, Plaza Hotels, and Bergdorf Goodman. Easton’s family traces their tea roots to the early 1800s, when ancestors first introduced tea plants from India and China to the Colony of Ceylon, thus building one of the largest and best cultivated tea estates on the island. 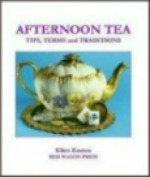 72 pages of how to’s, 27 photos, history, etiquette and FAQ about afternoon tea, serving styles and more.